Thomas Ravaux hired a lorry to pick up all of the rubbish - which included rubble, furniture, toys, bags, and other large items - that his former tenants had left behind when they vacated his 120m² property in the small French town of Rozoy-sur-Serre (Aisne, Hauts-de-France). The tenants had reportedly left without warning after 14 months of unpaid rent, and had stopped replying to Mr Ravaux’s calls and letters. According to Mr Ravaux’s updates and photographs on social media (below), the tenants - who he said have three children - had left the property "in carnage". The rubbish included a lorry-worth of debris, rubbish, children’s toys, old magazines, papers, plastic buckets, white goods, old computers, towels, clothes, and pieces of broken furniture strewn across the floor, in all of the rooms. Mr Ravaux said they had also left rotting food in the fridge. The property, which Mr Revaux renovated himself to rent out ten years ago, required deep cleaning and repair following the tenants’ departure. 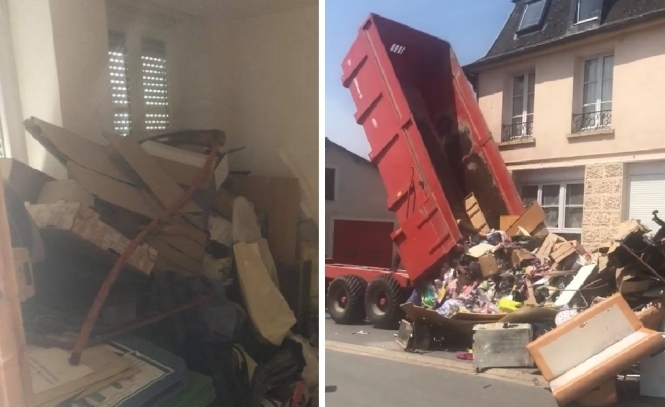 In response, the homeowner decided to “return it all to them” in a truck, and filmed the moment that the rubbish was dumped in front of what Mr Ravaux explained is the former tenants’ new home. The video, posted on social media, has had almost half a million views at the time of writing. And, while dumping rubbish in a public place usually carries a fine of up to €450, Mr Ravaux is not too stressed. The rubbish has now reportedly been cleared away, with the former tenants said to have finally cleared up the debris and taken it away. Mr Revaux continued: “The old tenants had to take everything to the rubbish tip themselves. Everything has now gone."